Sir Cumference and Lady Di discover Fracton numbers while purchasing cloth and cheese at the Fracton Faire. While twofourths may seem like the same as one-half, in truth it denotes two parts of one-half, or two quarters of the whole. 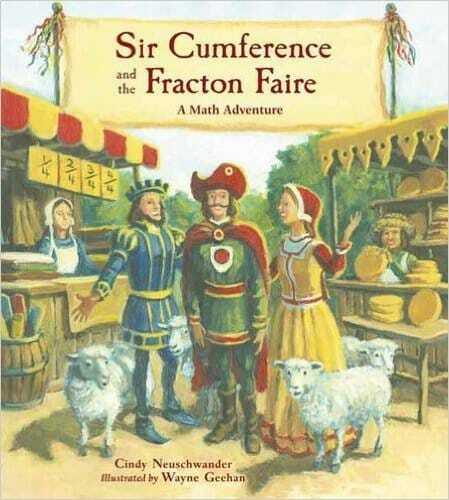 But the real mystery is the fact that items at the fair keep disappearing, and Sir C, Lady Di, and the Earl of Fracton must set a numeric trap for the thief, teaching an important lesson along the way about the comparative size of fractions. Puns both literal and visual abound in this fun adventure story with beloved characters and a solid pedagogical foundation.